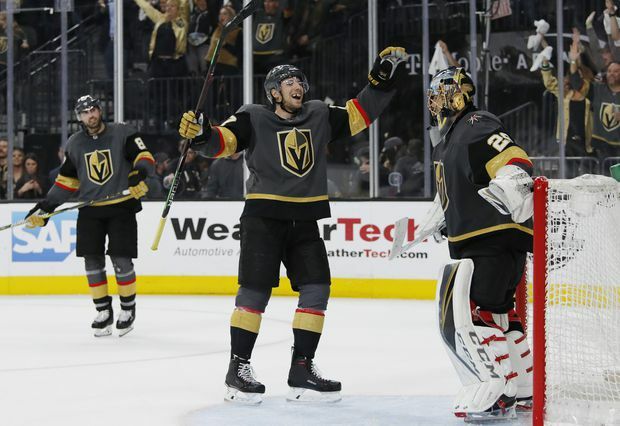 Vegas Golden Knights defenceman Shea Theodore, centre, celebrates with goaltender Marc-Andre Fleury after the team's win over the San Jose Sharks in Game 4 on Tuesday, April 16, 2019, in Las Vegas. He found all 28 shots fired at him Tuesday night, and the 15-year veteran added another spotless performance to his storied post-season career. Fleury has stopped 87 of 93 shots in the last three games. He moved into a tie for fourth place in playoff shutouts and improved his career goals-against average in the post-season to 2.58. Since losing Game 1 on the road, the Golden Knights have never trailed and they’ve outscored the Sharks 16-6. The Sharks outshot Vegas 28-27. After the first two periods, San Jose had 15 shots on net from the slot, but Fleury’s brilliance throughout the game was the difference. The Golden Knights continued to hurt San Jose in the opening moments of periods, as Pacioretty’s first goal marked the 10th time in 18 games they scored in the opening five minutes against the Sharks. Tuch ended an eight-game goal drought when he gathered a long rebound, manoeuvred through the defence and beat Dell to make it 4-0 with a little less than 14 minutes left. NOTES: The Golden Knights are the first team in NHL history to score in the opening 90 seconds of four consecutive post-season periods. ... Tuch’s goal marked the 13th time San Jose defenceman Erik Karlsson was on the ice when the Golden Knights scored. ... The Sharks were without injured centre Michael Haley and defenceman Marc-Edouard Vlasic. San Jose centre Joe Thornton served a one-game suspension for an illegal hit on Vegas left wing Tomas Nosek in Game 3. ... Stone became the eighth player in the last 30 seasons to have 10 or more points in his team’s first four games of a post-season.